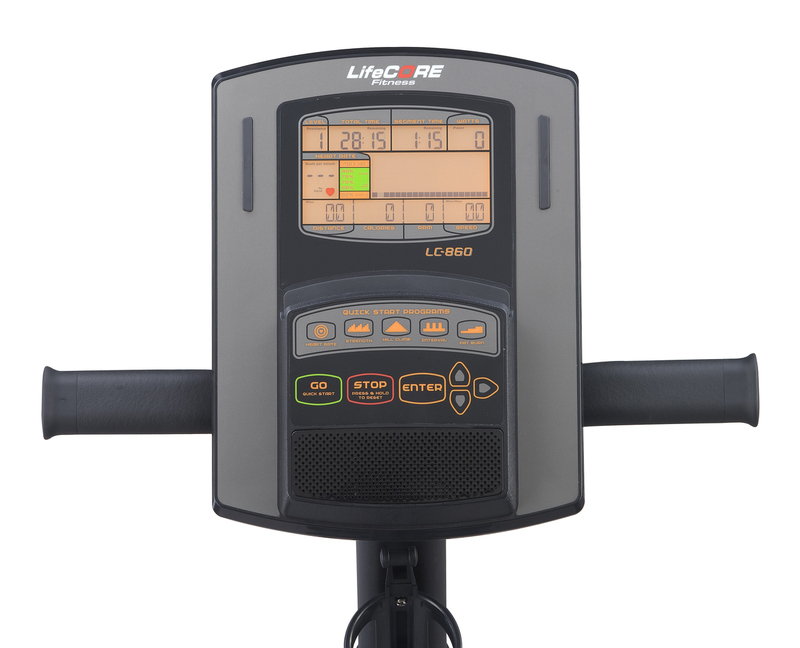 If you're looking for a solid home exercise bike, the LifeCore 860RB is a good choice. 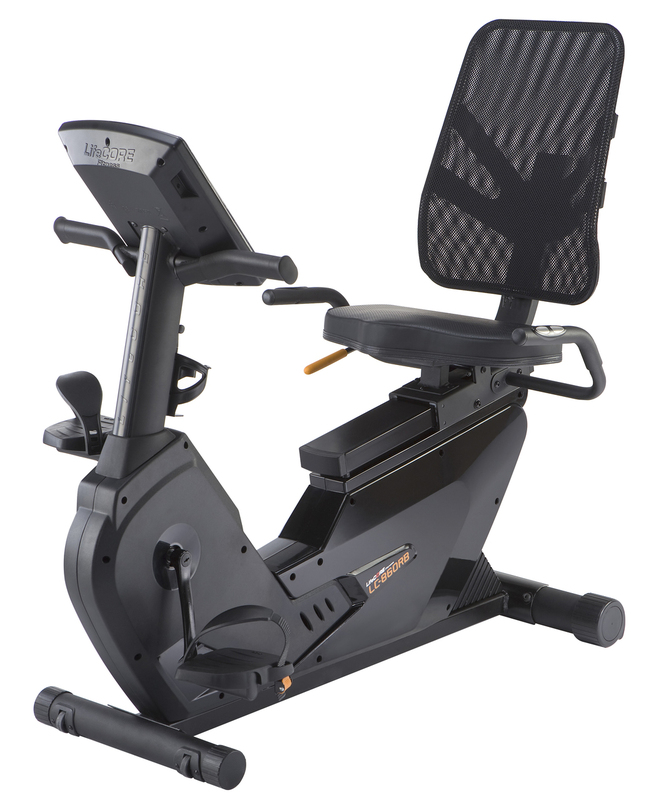 With near silent operation, 16 levels of magnetic resistance and a generous 22 built in workouts, this recumbent has everything you need to help you reach your fitness goals. The 860RB was recently redesigned and features an entirely new look. Rather than the black, silver and gray of the previous model, it is now all black and much sleeker, with several new advanced features we haven't seen before. LifeCore has created a nice niche for themselves in the residential fitness equipment market, focusing on affordable, well-designed exercise bikes and rowing machines. The 860RB is their entry level recumbent, but by no means is this bike entry level. As we mentioned, it was recently redesigned and features a number of notable upgrades from the previous incarnation. The first thing you will notice is the whisper quiet operation, with its sealed V-Belt drive system. You can listen to your music with the mp3 jack and speaker system, or watch TV without the distracting noise of the bike's operation that you experience on some bikes. The seat is also highly adjustable, which is another thing that you don't find too often. In addition to the typical fore/aft sliding adjustments, you can also choose from 6 different height levels. So you can really get yourself into the ideal position, which makes it much more comfortable. Speaking of comfort, the seat is oversized and padded, with a vented back. This is beneficial during long workouts, when you can start to feel pain if you're not in a well-padded saddle. There's heart rate monitoring built right into the handlebars, another new feature. There are a whopping 22 built in programs including heart rate control, intervals, fat burning, strength and hills...plenty to keep your workouts varied and challenging. The LifeCore 860RB also has 16 levels of resistance, so you can do your own manual workout and just choose your own resistance levels when you don't want to do a particular program. The new LCD display console is bright and easy to navigate, and shows you your distance, time, calories, RPMs, heart rate and watts. It also has quick start and stop and easy touch controls. Some of the extras include new front and rear stabilizers, a tablet holder and three user profiles: User 1, User 2 and a Guest User. Any negatives? Not really. It would be nice if it was compatible with a wireless heart rate monitor for more accurate readings, but if that is something you need take a look at the up-level 960RB. We like the LifeCore 860RB, as it gives you everything you need for a solid workout...smooth, quiet motion, 22 diverse workouts, 16 resistance levels, high adjustability, comfortable seat and stable, solid design. It will run you around $1000 on sale, which is a fair price for all of those features and capabilities. Again, if you want wireless heart rate monitoring check out the 960RB, which comes with more workout programs and resistance levels, tilting seat and commercial grade features.